H.H. 16th Gyalwang Karmapa, photograph Peter Mannox. "For a very long time, I have wanted to do something to commemorate the 16th Gyalwang Karmapa, Rangjung Rigpe Dorje. Although it has taken me so long to do something that honors his memory, it is a great privilege for me to be able to produce this book now. The aim of this publication is not merely to collect historical images, but to produce certain feelings and emotions. This book should serve as something impervious to the processes of birth and death, allowing us to know and to feel that we have never been parted from the 16th Gyalwang Karmapa – that he is in fact with us still. For those who did not have the great fortune to meet him themselves, I hope this book offers a glimpse of what it meant to encounter him personally. 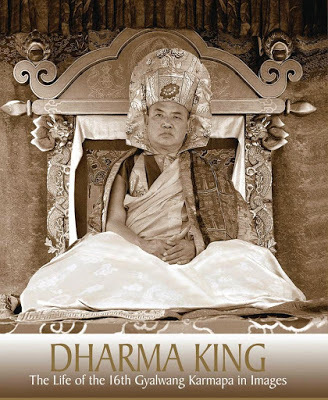 The 16th Gyalwang Karmapa seldom gave Dharma teachings through words, but taught intensively through physical gestures, and tamed beings through his mere presence. As a tribute to this special quality of the 16th Gyalwang Karmapa, this book offers these images as a basis for experiencing his physical presence. One of his major activities was to liberate all those who saw him, as he did when donning the Black Crown, so there is undoubtedly great value in any visual connection made with him. I make aspiration prayers that all those who see these photos or hold this book in their hands may receive the full benefit of his actual presence. Great beings are not born great, but in the course of their lifetime from birth to parinirvana, their activities naturally come to reflect their greatness. These photos reveal the gradual unfolding of an astonishing range of activities, all accomplished in one far-too-short life. Among his many life achievements, the 16th Karmapa presided over the Karma Kamtsang lineage during the tumultuous transition from its traditional bases in Tibet into diaspora, where it was no longer supported by the traditional culture and geography of Tibet. He ensured that his heart sons and the other lamas upholding the Karma Kamtsang all had a sound base in Sikkim after their escape from Tibet, and provided them with leadership, hope and a vision for the future in a land that was new and alien to them. Except through sheer spiritual power and fierce commitment, it is hard to imagine how anyone could bring the lineage through such radical changes intact, much less lead it to flourish. Yet looking at these photos, we can feel clearly the spontaneous joy of his perseverance, which makes his accomplishments seem so effortless. I am deeply inspired by the 16th Karmapa’s resilience in the face of these obstacles. I take courage in how much he could achieve despite the great adversities he faced. When we look at these photos, we are gazing back at a golden age that prevailed under the leadership of the 16th Gyalwang Karmapa. We may yearn to return to those golden times, when the lineage was whole and united. I myself look on that period with great longing, and am constantly praying that we can enjoy again that time of harmony and wholeness. Just as the images of all the places he visited and the people he met are united here in these pages, my heartfelt aspiration is that we can all join together to work side-by-side to benefit the beings of this new century. I pray that this happen soon; the magnitude of the suffering of beings is too great, and the social and environmental challenges facing the world today are too heavy for us to bear separately, and can only be fully addressed if we are united. The idea of publishing such a commemorative volume was originally conceived as part of the Karmapa 900 celebrations, but due to the enormity of the task of researching and collecting all the images, it required until now to complete. I would like to express my thanks to all those who helped in creating this book, especially to Damchö for undertaking this project on my behalf, and to Louise Light for all her work in designing the book, as well as to the generous sponsors and to all those who contributed photographs."